At the top of the mountain that dominates the island. 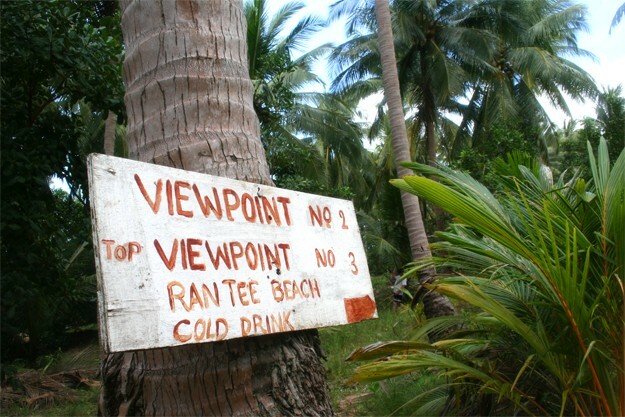 From Tonsai village, follow "Tsunami Evacuation Route" and "Viewpoint 1" signs. 30 Baht entrance fee. A hundred Baht for a drink or a snack at the viewpoint bar. 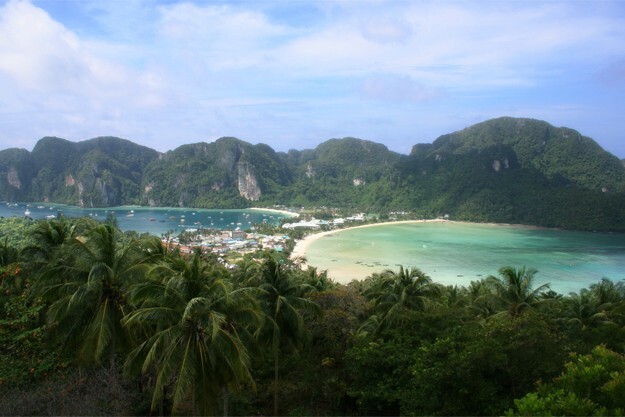 The short but intense climb to the Viewpoint (186 meters above sea level) is a "must do" on Phi Phi. And why not go there during the first days of your stay? This is an excellent introduction that will give you a nice overview of this mysterious island, which only the eastern part is inhabited. In the distance we see Phi Phi Leh, a rugged and inhospitable rock, lost in dark waters. We are far from suspecting that this stone hides one of the most beautiful beaches in Asia, perhaps in the world : Maya Bay. But before that, it will take patience and courage. The first part of the climb is also the most intense. At first, steep stairways climb the mountain, immediately followed by a paved trail, easier and more enjoyable. After a twenty minutes walk through the jungle, we discover a lush tropical garden with exotic flowers. You've arrived ! Photo: On the way to Phi Phi Viewpoint. Large flat rocks are used as viewing platform (do not slide!) from where one discovers Phi Phi Don "from the sky". From here, water is even more turquoise, long tails appear to float in the air. We never tired of taking pictures of emerald waters of Loh Dalam and Ton Sai Bays. Highest point of the island, Phi Phi Viewpoint is the place where the whole population has to go in case of a tsunami warning. Everywhere in the island, "Tsunami Evacuation Route" signs can be seen. 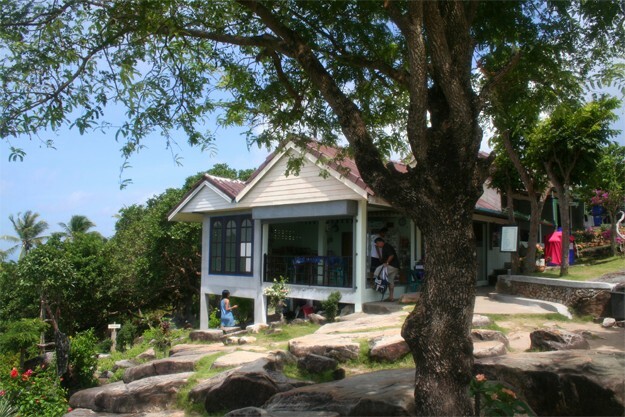 There is a small bar at the Viewpoint, facing the open landscape, which sells soft drinks and some snacks. Photo: Phi Phi Viewpoint snack bar.